Remote Air Cooled Condensers & Fluid Coolers. With a comprehensive line of Condensing Units that Johnson Thermal Systems provide, Our customers can be confident that we are able to engineer, manufacture and deliver any unit that a customer can imagine. 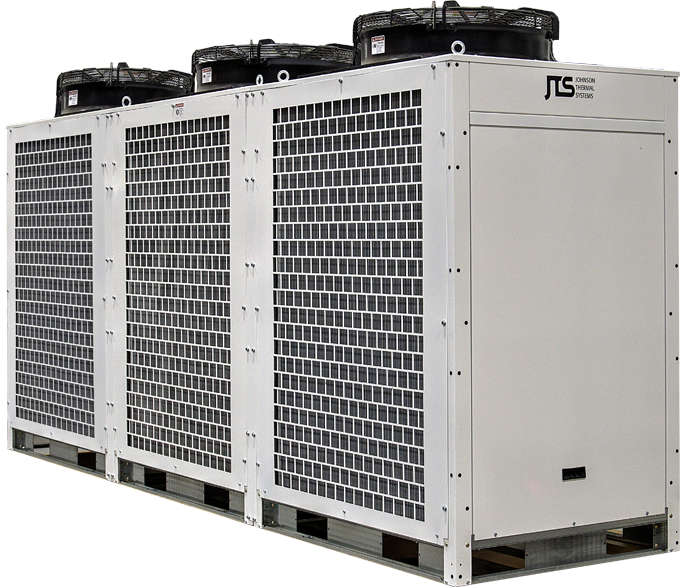 JTS Remote Air Cooled Condensers can be used as a stand-alone component to any refrigeration system and are compatible with multiple refrigerants. Fluid Coolers can be integrated into any JTS Chiller to provide energy savings or used by themselves for a variety of industrial heat rejection applications. At JTS You Always Talk With A Human. Get in touch with us! We'd love to hear from you. If you have an upcoming project or existing product that requires the friendly and professional touch, we would love to work with you. Fill out the below form and we will be in touch shortly! Or, feel free to call us! Our mission is to offer our clients the highest quality refrigeration products, electrical control products and packaged control room systems by providing an unmatched combination of price, quality, and service. We will cultivate our competitive advantage through teamwork, knowledge, communication, and technology. We will focus on profitable growth through alliance with customers who embrace strong relationships and allow us reasonable profits for outstanding products and services. Copyright © 2018 Johnson Thermal Systems.